I spent some of my early childhood in a modest rural area. It was a wondrous time – instead of growing up in the luminous glow of a computer screen, I spent my days outside in the wooded paths and parks that surrounded our quiet cul-de-sac. It was a fearless time where I learned to test the limits of my fledgling agility and developed a rapport with the landscape surrounding me. I loved to test my balance by walking on fences, railings, road curbs, and the perilous edges of the ravine that bordered the park. 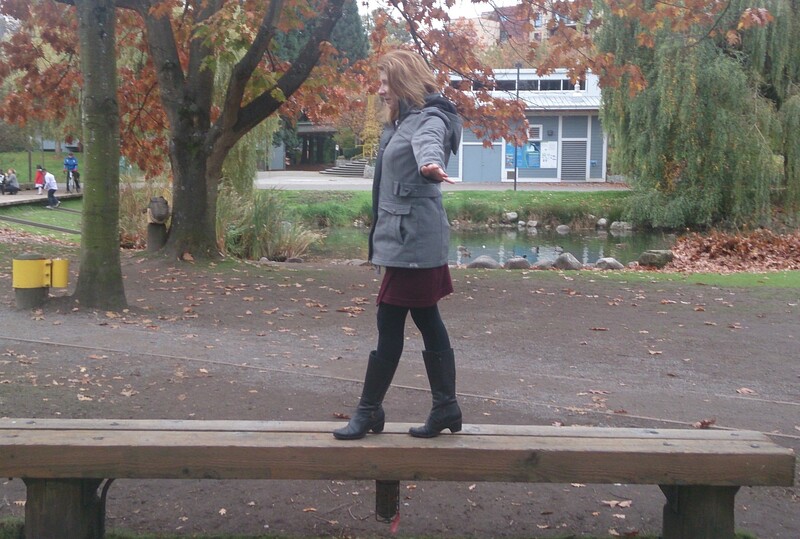 I imagined myself a gymnast defying the narrow body of the balance beam or a circus performer walking the high wire. In the woods behind our house the fallen tree trunks provided the perfect bridge over murky puddles after a rainfall. If I fell one way, I landed in mud; if I fell the other way, I landed in the fresh dew-kissed grass. This playful skill followed me into adulthood where I learned that life itself is a constant balancing act, tilting between work and family, school and play, wellness and disease. Walking the line of chronic illness can be a slippery ordeal. Every day I warily place one foot in front of the other, wondering which way I will tip – some days I tilt towards the flickering flames of RA, other days towards the soothing spring of wellness. I will have three mighty days of grace before tumbling into the chasm of illness; I will have two days of unceasing flaring and then four days of absolution. This is the repetitive balancing act of life with RA. The good days blissfully lull me into a false haven, where I feel divine, dancing and twirling on my wire, forgetting that it only takes one bad step to slip and plunge into the woven net below. I forget I am not as young as I was, not as fit as I was, not as healthy as I was. I have to always be prepared to recover my balance. In my childhood days, it was all about the thrill of the challenge – would I make it all the way across without falling? Now it’s about the necessity of survival. I have battled this disease for almost six years. I have come to know it like my own reflection in the mirror. I bear its tantrums, and I celebrate its calmness. I have learned how it operates within the realm of my body. I’m not as surprised as I used to be when I wake up with an unexpected flare after three glorious days; I’m also not as defeated. I know that when I fall, I will land into a net woven with the thread of others who have fallen before me. There I can rest and linger for a bit, before picking up my balancing stick and making another attempt at that wobbly trek between health and wellness. I never know until I take that first step if I will be walking along a delicate wire or strutting along a solid beam. There will be days I will tip, but not fall – these are the days I find diamonds in the granite. I have walked between fear and poise, anger and calm, happiness and sadness, heaviness and lightness. Every time I step out onto that wire, I am reminded of the things I can achieve in the sphere of my new limitations. Sometimes I walk, sometimes I prance, and sometimes I crawl but nevertheless, I walk that wire every day. Nice post J.G. Life most certainly is a balancing act. I wonder what kind of life kids have these days… doesn’t seem like much of one to me… Like yourself, I grew up with the great outdoor rather than the glimmering screen. Thank you Kev. The world is run by technology that’s changing every day. I like to think that there are many who escape the glow and get outside every once in a while, maybe to test their balance on fallen tree trunk 😉 . Hope all is well. Thank you. I am still finding my balance after a lot of life changes (a move, career change, my mom’s death, health problems), and i find that I need to start over every day. (I think I spent months with that feeling of “almost falling.”) Right now, life feels exactly like a balancing act. I hope that in your balancing act you will spend more time tipping towards wellness. I wish you strength to keep your balance in all things. Stay well. That’s exactly how I feel about RA. It’s walking a high wire. Here’s hoping you stay balanced! I love this post. Life is a balancing act whether living with disease or not and like you, time makes it easier. Thank you. Wishing you an easy walk across your wire. Stay well.